After every tragedy involving a gun, there is a sudden cry from millions calling for various gun bans and controls. Do I support these measures or not? My idea of the best use for a gun is to recycle it into a farming implement. What does the evidence suggest will happen if we do that immediately? 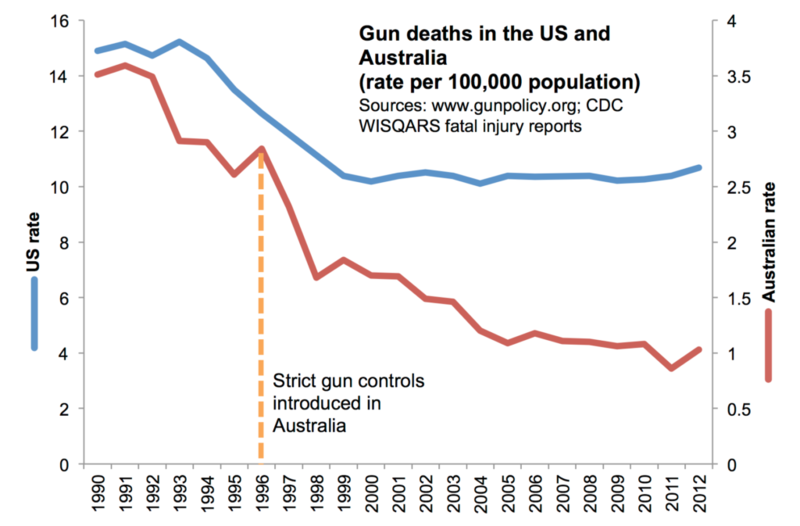 One of the most prominent bans on guns was in Australia in 1996. Let’s examine the Slate article praising Australia’s ban. I’ll discuss some of the key points. (1) homicides by firearm plunged 59 percent between 1995 and 2006, with no corresponding increase in non-firearm-related homicides. Murdering Australians have never preferred killing each other with guns. They prefer knives and other methods. When guns were banned, they just used other means to kill each other for a while. The decline in homicides that began in 2003 was, more than anything else, led by the decline in “other means” homicides. Australians, much to their credit, just don’t want to kill each other as much anymore. 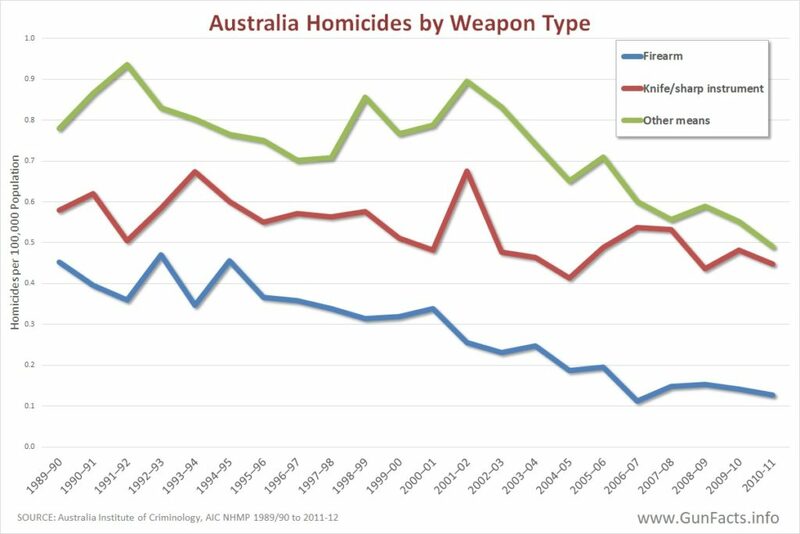 The wider point is that the decline in homicides in Australia just continued the trends that were already in place. The current decades-long decline matches that of other countries, including the U.S. The U.S., for example, experienced a substantial drop over the time period immediately following Australia’s ban. At best the gun ban had no effect on homicides at all. At worst it resulted in greater crime and homicides. Either way, it was not a positive effect. (2) The drop in suicides by gun was even steeper: 65 percent. 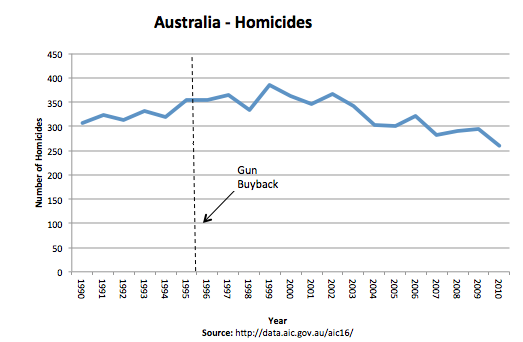 Studies found a close correlation between the sharp declines and the gun buybacks. The majority of gun deaths, in both the U.S. and Australia, are not homicides but suicides. Suicides by firearm in Australia did indeed decline precipitously following the ban. Unlike the nearly non-existent effect on homicides, the drop in suicides by firearm was sudden and profound. The key question is whether or not the drop in gun-related suicide deaths resulted in a corresponding increase in suicides by other means. In 1996 suicide rates were elevated at ~14 per 100,000. In 1997, immediately after the ban, the rate peaked at 18.4 per 100,000. Thereafter the rate declined to its lowest point of 9 per 100,000 in 2005. As of 2015 the rate was back up to 12.6. In 100 years of tracking the statistic, the rate of suicides among Australians has remained relatively flat in the 12.5±5 per 100,000 range. 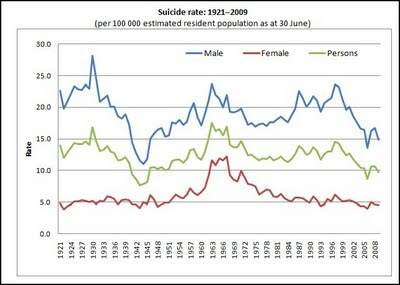 The current suicide rate appears to be near the historical mean. If banning guns reduces suicides, why did the suicide rate spike immediately following the ban? However, in the next few years there was definitely some suggestion of correlation as suicide rates plunged along with total gun deaths. Nevertheless, any effect was only temporary, given current rates. Those who want to kill themselves have, unfortunately, found other ways to accomplish their plans. Moreover, the decline in suicides spanned a decade, suggesting that the ban was not the primary cause. (3) Robberies involving a firearm also dropped significantly. Meanwhile, home invasions did not increase, contrary to fears that firearm ownership is needed to deter such crimes. The data used by the Slate article has been carefully cherry-picked to make it seem like there was a huge positive benefit to banning firearms. Robbery involving a firearm decreased, but victims of robbery increased by a greater proportion, remaining elevated for seven years following the ban. This is a particularly heinous misrepresentation as a common claim by those who oppose bans is that removing guns leads to an increase in crime. 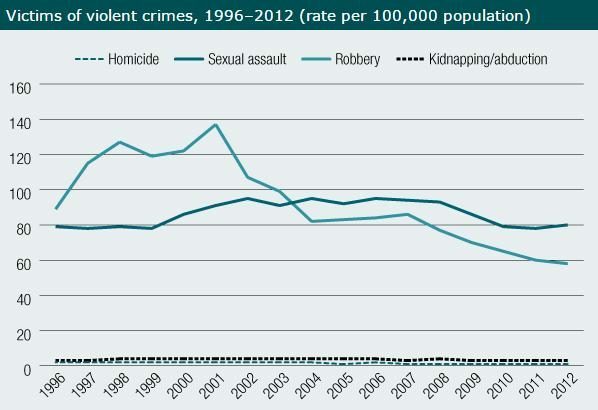 Over the same period of time shown in the above graph, the violent crime rate in the U.S. declined and did so significantly. During this time, millions of guns were sold in the U.S.
(4) But here’s the most stunning statistic. In the decade before the Port Arthur massacre, there had been 11 mass shootings in the country. There hasn’t been a single one in Australia since. This most stunning statistic is also misleading. There was a shooting at the Monash University in 2002, where 2 died and 5 were wounded. The USA Today published the same claim on February 15, 2018. In both articles, a mass shooting is defined as 5 or more killed. In the U.S., this would be included in most school shooting lists even if it didn’t qualify as a mass shooting. Regardless, the Slate article’s claim misleads by implying that gun violence against civilians completely ceased when it did not. Gun bans do not eliminate all gun violence, even if they eliminate most. Mass and school shootings do indeed decline if guns are removed. Given the relative rarity of these events, the costs and benefits must be weighed. Australia’s example does not inspire confidence that a gun ban would result in a positive outcome, and that’s ignoring the cultural and Constitutional problems that are unique to the United States. Moreover, the evidence indicates that banning guns will result in more violence and death. Advocates for gun control should be careful not to advocate evil in the name of politics. 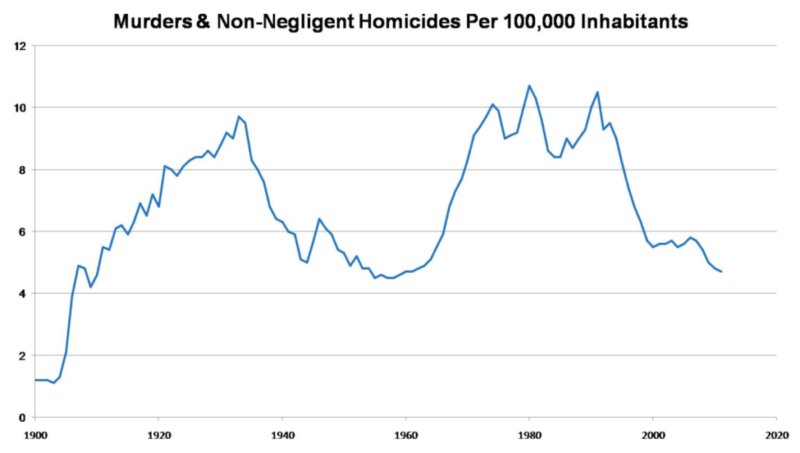 It took years for gun-related homicides to fall substantially after the gun ban took effect. It didn’t decline until other factors declined faster. The crime rates in Australia were already quite low to begin with. The gun ban was in response to a problem that Australia really didn’t have. The same cannot be said for the U.S., where the crime rates had much more room to fall. So while we can only draw limited conclusions from these statistics, the simplistic claim that banning guns will result in a noticeable improvement in crime rates is not supported by this evidence. If anything, the conclusion is the opposite: that banning guns will result in a noticeable increase in crime. Caveat emptor: Wikipedia claims that the specific definition of mass shooting used here was used in the following paper used to show that Australia’s gun law was successful. There may be other mass shootings that don’t qualify under this particular definition. Researching this is out of scope for this article, but those basing their public policy on this should understand that they are not comparing apples-and-oranges to the more broadly inclusive definitions used in the U.S.